We invite you to explore India - the Land with infinite beauty ! Whether you soar high into Himalayas or peer under the ruins of the Ancient monuments dotting the landscape of India, you will cherish the experience long after your visit ! This India Travel Guide on Holy Redeemer Basilica Trichi is free from any commercial interest! This site is dedicated to promote India - the vast subcontinent, its glorious past, magnificent landscape and its infinite variety. 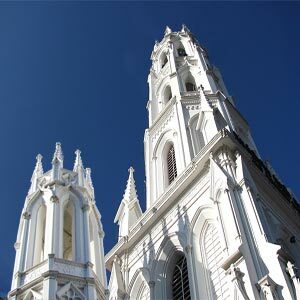 Located in Palakkarai, Trichy is the Basilica of the Holy Redeemer completed in the year 1881. Built under the auspices of the Melaputhur Church, the Basilica of the Holy Redeemer was built during the British period under the control of Diwan Kanjamalai Mudaliyar in 1846. The inner walls of the Holy Redeemer Church are adorned with paintings that depict the history of saints and the events leading to the capture of Jesus Christ. Significantly, these pictures were drawn by Brother D Irudhaya Raj who studied in the seminary of this church. Judge Woodroofe donated the 'Big Bell' to the church in 1881. The bell is the second biggest bell in Tamil Nadu. The center of attraction is the 'Sagayamatha' - Mother of Perpetual Help Basilica which has a massive roofed hall divided by huge colonnades. 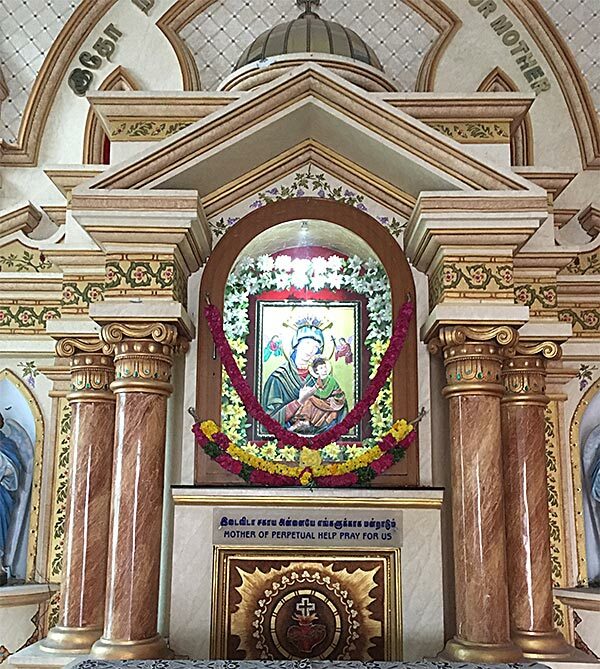 Sagaya Madha - Mother of Perpetual Succor or Mother of Perpetual Help is always venerated with enthusiasm in South India. We commend ourselves to the care of our heavenly Father. You can find a raised dais and aisles and arcaded spaces flanking the sides. Sunlight pours in through the clerestory windows on account of the unique position of the central aisle vis-à-vis the flanking aisles. Over time, the church has been expanded to accommodate more worshipers. Observe the east west orientation - an external emphasis on the west front and the long arcaded interiors. High vaulted roofs and windows with glass stained adorn the basilica. A sanctuary and an altar are found on the eastern end of the building. This Holy Redeemer Church at Trichy is famous not only for its attractive architecture but also for its church foundation that provides food for the poor and runs various institutions and schools. 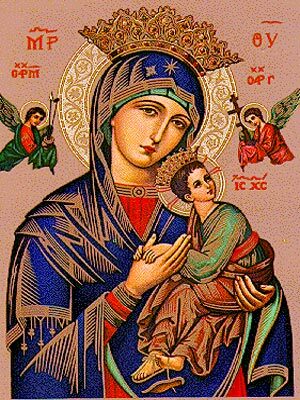 You can participate in the Novena for the Mother of Perpetual Help every Sunday in July. A star on Our Lady's veil, representing Her as the 'Star of the Seas' who brought the Light of Christ to the darkened world - the star that leads us to the port of Heaven. Christ's falling sandal represents Christ's Divine Nature - barely clinging to the Earth. His Human nature is represented by the other sandal firmly affixed to the foot.